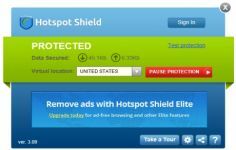 Hotspot Shield is a useful solution for personal data protection when surfing the internet. Hotspot Shield is a software mainly designed to protect users during the navigation on the Internet, being a safer way to connect to many free access points blooming in each city. Hotspot Shield enables you to establish a secure VPN connection between the laptop or other mobile or PDA, and a public Wi-Fi hotspot. Thus the transmitted data passes through a protected tunnel is encrypted. The IP address is also amended to browse anonymously on the Internet. The program not only protects users against the recognition of their identity , but it also brings security passwords at all sites visited requiring them. In case it shall issue the credit card numbers or bank account numbers , Hotspot Shield also ensures confidentiality. In short, all private information provided on the website are protected by this software. 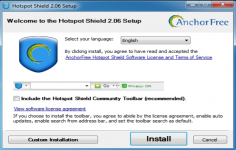 Hotspot Shield requires no special computer knowledge because it is easy to handle. Curently we don't have any log information about Hotspot Shield version 7.15.1 for PC Windows. We will this change log update soon!